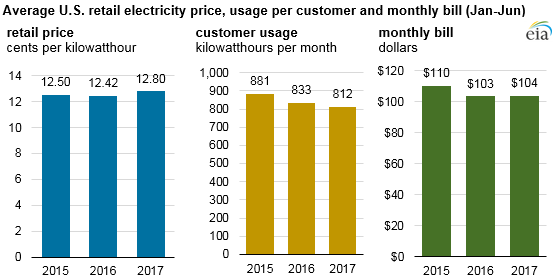 Retail electricity rates paid by U.S. residential customers averaged 12.8 cents per kilowatthour (kWh) during the first six months of 2017, an increase of about 3% compared to the same period in 2016. First half of 2017 average electricity prices are higher than last year in most areas of the country, with only six states experiencing lower prices. The Pacific noncontiguous states of Alaska and Hawaii have the highest electricity residential prices in the nation. Hawaii's retail price averaged 23.3 cents/kWh in the first half of 2017, and Alaska's average price was 18.1 cents/kWh, which were 9% and 5% higher, respectively, than in the same period in 2016. As a group, the six states in the New England region have the second-highest residential electricity prices in the nation, but in the first half of 2017, New England’s average residential electricity price was only 0.5% higher than during the same period last year. This small increase follows a 3% decline in average annual New England prices during 2016. Some of the early 2017 increase in residential electricity prices can be attributed to the rising costs of fuels used for generating power. For example, the cost of natural gas delivered to U.S. electric generators during the first half of 2017 averaged $3.53 per million British thermal units. This cost was 37% higher than in the first half of 2016, and the average delivered cost of coal was down about 2%. An additional driver for increased electricity prices has been the trend in recent years for power utilities to increase their expenditures on infrastructure for the transmission and distribution of electricity. Residential electricity bills reflect changes not just in prices, but also in electricity usage. In the first half of 2017, the average residential customer was consuming an estimated 812 kWh per month, down 2.5% from the first half of 2016. Residential customers were using less electricity earlier this year primarily because of milder weather than in the first half of 2016. Milder winter temperatures reduce the need for electric heating, while cooler summer temperatures in many areas of the country reduce the need for air conditioning. The lower average usage of electricity offset the increase in retail prices. The average residential electric bill was about the same amount as last year, averaging $104 per month between January and June 2017. EIA’s latest Short-Term Energy Outlook expects electricity prices will remain higher during the second half of 2017 than in recent years. In 2017, the annual average U.S. residential price is forecast to be 3.6% higher than in 2016, averaging 13.0 cents/kWh. Forecast annual average electricity prices are higher across all regions in 2017, ranging from an increase of 2.2% in the Mountain states to 6.4% in the East South Central states from 2016 levels. Mild summer weather continues to keep forecast electricity usage lower during the second half of 2017 compared with 2016. EIA expects the typical U.S. residential customer will spend $1,350 for electricity in 2017, almost exactly the same as annual average expenditures last year.